This article is about GregTech's Aluminium Ingot. You may be looking for another type of Aluminium. The Aluminium Ingot is a type of Ingot that can be made via smelting Aluminium Dust, which in turn is produced mainly from Bauxite Dust. 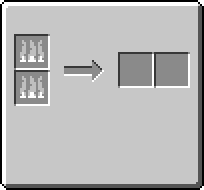 The Aluminium Ingot is used in many crafting recipes. Aluminium Ingots are used in many recipes such as Lithium Batteries. In addition, Aluminium Ingots can replace some other metals in some of the recipes to make production more efficient, such as Mixed Metal Ingots and Electronic Circuits. It should be noted that XyCraft's Aluminum and GregTech's Aluminium (note the difference in spelling) are two distinct items that cannot be converted into the other. No GregTech recipes may use XyCraft Aluminum, and vice versa. Aluminum vs Aluminium: Although the International Union of Pure and Applied Chemistry (IUPAC) officially standardized on aluminium in 1990, they acknowledged aluminum as an alternate spelling, and both spellings are found in IUPAC's current reference materials. The United States is the main country where Aluminum is widely used over Aluminium. This page was last modified on 30 December 2017, at 01:01.